I've been using the KLEI Innovations Interconnect cables since April 2014 and in that time I have become very accustomed to their exceptional performance characteristics and realize there are very few interconnects that can come close to providing this level of fidelity. In the time since my review of the KLEI gZero20 IC’sin January 2015, Keith Louie Eichmann (aka KL) of KLE Innovations has hinted at some forthcoming developments out of his R & D that he was very excited about and which he had decided to apply to his existing line of interconnects. which in turn assists the customer in selecting the Interconnect that is best suited to their needs and budget with an optimum outcome. This approach, so early on in the product development lifecycle, seemed to me to indicate KLE Innovations was adopting a very customer centric approach. So I was hoping that these new changes would not distort these particular facets of the product line. So What Was This Exciting New Development? During his R & D efforts, KL had refined his gZero Architecture/Technology, improving on it’s abilities with each successive model. He then decided to try the some of those refinements on his entry level interconnects and found they provided significant improvements in their performance without significantly increasing their cost. signal conductor and holding the neutral/ground sides of attached components at a steady state of zero volts and as such is referred to internally as gZEROs for ground zero state", but will continue to be termed simply as gZero Architecture/Technology. So Which Models Have Been Improved And What Are The Benefits? The improvements have been applied to the KLEI gZero2, 3, 6, 10 and 20 IC’s. QUOTE: “The new gZEROs Architecture elevates the KLEI gZero2 Interconnect almost to the same level of performance as previous/old KLEI gZero6 model"
But would the magnitude of the improvements observed between each successive model in the lineup diminish as you approach their top of the line products? To assist me in answering that KL had sent me the current/new KLEI gZero6, 10 and 20 IC’s for evaluation. Since I reviewed them in January 2015, I’ve been using the previous/old KLEI gZero20 IC’s and since I frequently leave my system running throughout the day, I would conservatively estimate they have now had close to 800 hours of playing time. In that time I have become very accustomed to their beguiling nature, to the point where installing any other interconnect in their place is immediately apparent, mainly because very few IC's can come close to providing that same level of haunting fidelity. KL had advised that upon installation of the new KLEI gZero6 IC’s in my system, I should allow them to settle-in for 24 hours before performing any type of serious auditioning. what I was not prepared for - that very same "beguiling nature", which had only ever been produced by the previous/old KLEI gZero20 IC’s was now being conveyed quite convincingly by the new KLEI gZero6 IC’s! Here was yet another model in the product line, whose performance had improved to a level approaching a model that was two levels its superior, just as I had observed when I reviewed the new KLEI gZero2 IC’s. That beguiling nature, I believe is due to the exceptional clarity, which allows far more details to be heard, especially in the area of venue acoustics and reverberations, which in turn produces a more accurate and realistic reproduction. Needless to say, the new KLEI gZero6 IC’s with the revised gZEROs Architecture/Technology are much more adept at reproducing a more believable performance, especially for music recorded in a live environment. What improvements should I expect of the new KLEI gZero10 IC’s? The bass extension in the extreme low end is not only lower, but superbly detailed and much better controlled. By comparison to the new KLEI gZero6 IC’s, the new KLEI gZero10 Interconnects provides a larger, more open sound, with crisper and more powerful dynamics across the entire frequency range. Their accuracy in the reproduction of the timber of various instruments is extremely life-like and regardless of whether the instrument is part of a full orchestral presentation or being played by a soloist in the foreground. Smaller ensembles, such as quartets/sextets are reproduced with a reality that many interconnects can only aspire to. Would they provide a significant improvement over the new KLEI gZero10 IC's? More importantly, could they justify their rather hefty price tag? 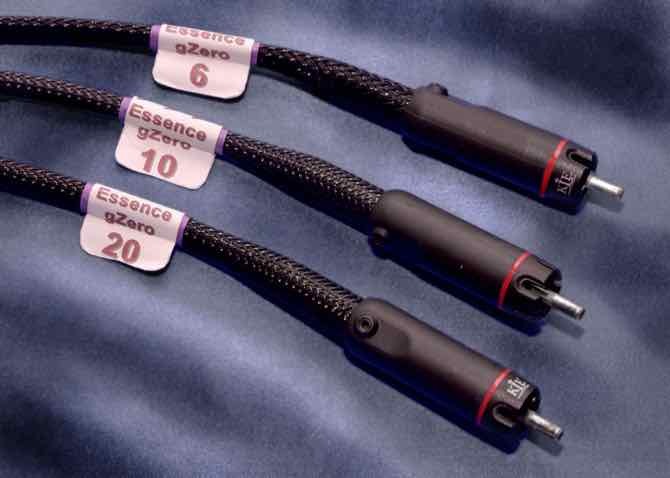 As with any top of the line product, there is always the issue of diminishing returns, since for most audio components and cables, attaining that ultimate performance comes at a higher price and the return is often far less noticeable in the upper echelon of a product range than it is between the entry level products. I had thought of following the same process as above, i.e. identifying improvements of the new vs. the old versions of KLEI gZero20 IC’s. But when I heard the new KLEI gZero20 IC’s, I realized this approach would be rather pointless, since it was quite clear the new KLEI gZero20 IC really is in a league all by itself! With IC’s of this ability, it's no longer about how each of the various metrics have improved, e.g. the dynamics are faster, the image is bigger, even though it was quite apparent. It's about what the new KLEI gZero20 interconnects achieve that is far more relevant! I spent considerable time listening and thinking of how I could convey the very special improvements I was experiencing. I listened for improvements in the various metrics and even though they were discernible, there was something much more appealing that was now being experienced in the music. It was the amazing pinpoint accuracy of performer placement within the image, together with the space surrounding them and finally the ambiance of the entire performance. I think the best way of describing the benefits of the new KLEI gZero20 IC’s, is to turn to the world of cinema. then the new KLEI gZero20 IC’s would be analogous to watching that same movie in IMAX-3D! Everything simply appears more focussed, having much more detail with a crisper presentation and a cavernous and spacious image. It's just downright eerie how the voice of each instrument or performer comes into immediate focus. Each commanding its position in a three dimensional space in such a way that it sounds more like each voice has its own individual speaker working on its behalf - even in full orchestral pieces. To get this level of coherence from a 2 channel system is extremely difficult and is often only available on a system that utilizes components that adhere to extreme design goals and uses high calibre parts in their circuitry. You know - the real pricey stuff ! When used on my digital source, the new KLEI gZero20 IC’s brought the performance as close to an analogue sound that I have experienced to date and gives my solid state system a very tube-like quality. The KLE Innovations cables are not the cheapest on the market, but I have found them to be the best that I have auditioned to date and at their price points, I find them to be exceptional value, especially when I look at the pricing of some of the high-end boutique and esoteric brands. Which model you choose is up to you, but I think you will be very happy with any of the models that uses the revised KLEI gZero Architecture. If your system uses high-end components, then I would recommend their top of the line products. If your system is more modestly priced and you find it a little difficult to entertain spending more on your cables than on your components, then try their entry to mid level interconnects. Also, there’s the effect that the architecture of that piece of wire can actually have on the performance of the attached components. he views the connection from the perspective of the internal circuitry. This development in the architecture has elevated the performance of their Interconnect product line to a level that I believe far exceeds all other interconnects from competitors and definitely those having a similar price point. Not only does the KLEI gZero IC’s have the ability to sound excellent in high end systems, they also bring out the very best performance from more modestly priced components. e.g. my DAC is one such component, costing around $420.00. But sounding as good as DAC's many time it's modest price point! The one outstanding feature of the new architecture is the clarity and detailing these cables now bring to the music. This is very apparent on orchestral pieces, which now sound so much closer to a live performance. So, do you replace any existing KLEI gZero Interconnects you currently own? That is a personal choice, but because each model utilizing the new architecture performs to a higher level, even an upgrade to the same model will yield significant improvements. How do you tell the difference between the new and old cables? I have always maintained that the KLEI product line offers exceptional value for money, but by implementing the gZEROs Architecture across most of their existing interconnect product line, KLE Innovations has just raised the bar on their competitors - by a significant margin! All of these interconnects are exceptional performers and are highly recommended for all systems!